The European Space Agency’s Sentinel-1 satellite, launched from French Guiana in April 3, 2014, should allow scientists to test this link in greater detail. Its satellite interferometric synthetic aperture radar – InSAR for short – is a spaceborne imaging technology that will help scientists understand how volcanoes work, according to study co-author and geophysicist Zhong Lu, Shuler-Foscue Chair of geophysics in SMU’s Roy M. Huffington Department of Earth Sciences, Dedman College. 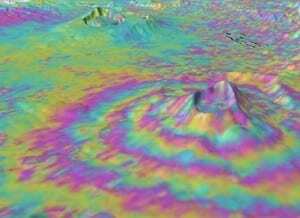 Volcano deformation – especially uplift – is often considered to be caused by magma moving or pressurizing underground. Magma rising towards the surface could be a sign of an imminent eruption. On the other hand, many other factors influence volcano deformation, and even if magma is rising, it may stop short rather than erupting. Juliet Biggs of the University of Bristol in England led the study. Biggs looked at the archive of satellite data covering more than 500 volcanoes worldwide, many of which have been systematically observed for more than 18 years. The researchers, who included scientists from Cornell University and Oxford University, applied statistical methods more traditionally used for medical diagnostic testing and found that many deforming volcanoes also erupted (46 percent). Together with the very high proportion of non-deforming volcanoes that did not erupt (94 percent), these jointly represent a strong indicator of a volcano’s long-term eruptive potential.